Pulled beef brisket seasoned with salt and pepper glaze with garlic mayonnaise. With garlic mayonnaise Tender beef brisket seasoned with spices, and a garlic mayonnaise side. Pulled Beef (72%), Garlic Mayonnaise (28%). 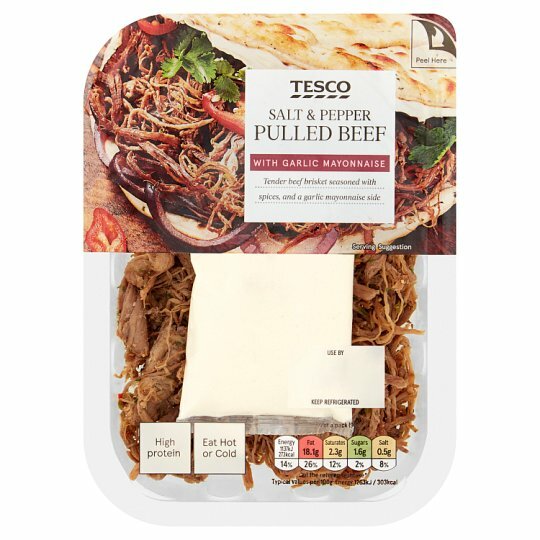 Pulled Beef contains: Beef, Sugar, Cracked Black Pepper, Maltodextrin, Salt, Cornflour, Sea Salt, Parsley, Colour (Plain Caramel), Dried Green Pepper, Dried Red Pepper, Ginger, Black Pepper, Garlic Extract, Onion Extract, Rapeseed Oil. Garlic Mayonnaise contains: Rapeseed Oil, Water, White Wine Vinegar, Egg Yolk, Garlic, Sugar, Corn Starch (Sulphites), Mustard Seed, Salt, Spirit Vinegar, Preservatives (Potassium Metabisulphite, Potassium Sorbate), Citric Acid. If heating, peel back film lid, remove sachet of mayonnaise and put to one side. Replace the film lid. Place pack on a microwaveable plate. Heat on full power. Leave to stand for 30 seconds before serving. Add mayonnaise and mix well. All appliances vary these are guidelines only. Check food is piping throughout before serving.